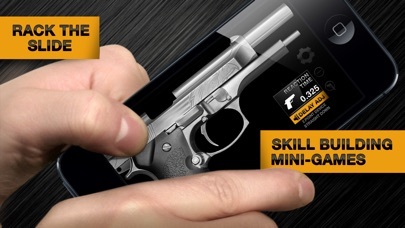 Welcome to the world of Weaphones, the ultimate firearms simulator for your iPhone, iPod and iPad. Blurring the line between digital and physical, Weaphones combines the two to create a fully interactive real world experience. Switch off the safety, load the magazine, rack the slide and fire, all without having the cops called on you. 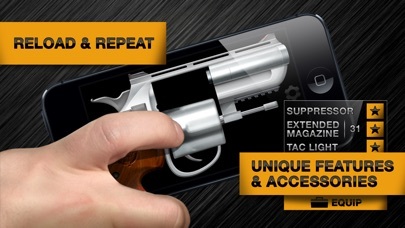 Ergonomically designed, Weaphones fit naturally into the shooter’s hand. All the important controls are located within a finger’s reach. 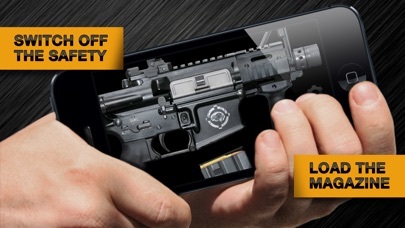 The ability to resize, flip, zoom and relocate the Weaphone assures perfect fit no matter the size of hand or screen. For the price of a couple of 5.56mm rounds you can have a full arsenal of Weaphones… and you won’t shoot your eye out. 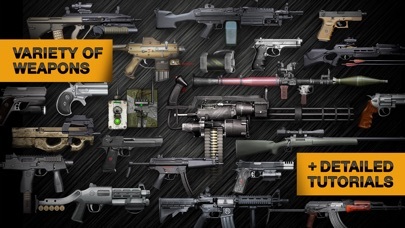 _______________________________ » Realistic Sound, Smoke, Flash & Recoil Effects » Full Interaction and Control » Authentic Weapon Mechanics » Mini-Games and Accessories » No Up-Sells or Upgrades, You Get Everything & Free Updates » Detailed Full HD Graphics » 100% Customizable to Fit User’s Hand Size and Preference » Lefty Flip » Rotate 180° » Scale » Move » User Adjustable Variables » Unlimited Ammo » Delay Timer (Grenade) » Auto Reload » Weapon Jamming/Overheating » Accelerometer Reloading » Camera Flash Shooting » Multi-Device Linking (e.g. C4 and Detonator) » Weapon State Indicator (“Why Am I Not Shooting”) » Ultra Detailed Step-By-Step Animated Tutorial for Each Weaphone » Multi-Touch, Accelerometer & Camera Flash Support » Social Media Driven Future Content _______________________________ Interactive Features: PISTOLS: » Trigger » Hammer » Slide » Magazine Release » Safety » Slide Release » Magazine » Flashlight » Laser » Suppressor » Optic » Mini Games REVOLVER: » Trigger » Hammer » Cylinder Release » Ejector Rod » Speed Loader » Revolving Cylinder ASSAULT RIFLES & SMGS: » Trigger » Charging Handle » Magazine Release » Fire Selector » Bolt Lock/Bolt Release » Magazine » Forward Assist » Stock » Sights » Dust Cover » Accessory (Laser, Vertical Grip) LIGHT MACHINE GUN: » Trigger » Magazine » Charging Handle » Safety » Receiver Cover » Belt Ammunition » Dust Cover » Laser » Carry Handle » Bipod SNIPER RIFLE: » Trigger » Bolt » Safety Lever » Magazine Release » Magazine » Mini Game SHOTGUN: » Trigger » Action/Slide » Folding Stock » Safety » Action Release » Shells GRENADE: » Spoon » Pin » Variable Timer CROSSBOW: » Line » Arrow » Safety » Trigger » Angry Bows Mini Game RPG: » Warhead » Charge » Safety » Trigger » Cocking Handle » Flip-Up Sights MINIGUN: » Safety » Trigger » Ammunition Belt C4: » Toggle Switch » Safety Cover » Fire Button » Charge 40MM GRENADE LAUNCHER: » Safety » Trigger » Barrel Latch » Action » Grenade _______________________________ What Some Of Our Users Are Saying: “Sets the bar high finally a 'firearms simulator' that isn't just a picture of a gun with a muzzle flash on the end. I'll never uninstall this app. “ - Wmkilgore (Google Play) “This game has got my eyes glued to the screen for almost 2 hours straight!” - codybeckham10 (iTunes) “Served over 25 years in various Military and L-E capacities, so any weapon you can name I've fired it. 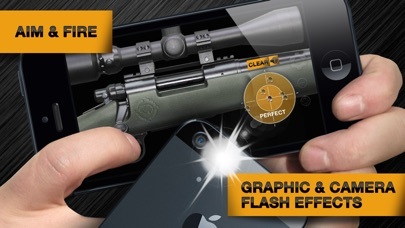 Realism is very well done… Love the addition of the laser and flashlight capability too. 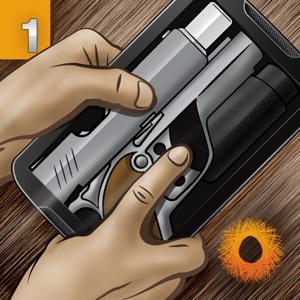 “ - JD (Google Play) “Weaphones is the most realistic gun simulator I've found to date.” - jon (Amazon App Store) _______________________________ » Please rate, review and join us on Facebook and Twitter to help decide what the next Weaphone should be.